Juan Ponce de Leon was born in the town of Santervas de Campos, Spain in 1474. Juan was just eighteen when he first came to Cadiz, Spain. In Cadiz he heard news of Columbus's 2nd expedition or “entrada”. At the time, people believed that gold was to be found by the basket full in the New World. Historians have no idea how Juan Ponce de Leon made it on board a ship in 1493, but it is assumed his family paid his way. The crossing took twenty-two days and during this time Ponce de Leon learned how to sail. The expedition landed on Sunday, November 3, 1493, on an island they named Dominica. Before long they discovered several new islands including the Virgin Islands, Martinique, Guadeloupe, Antigua, San Martin, and Montserrat. 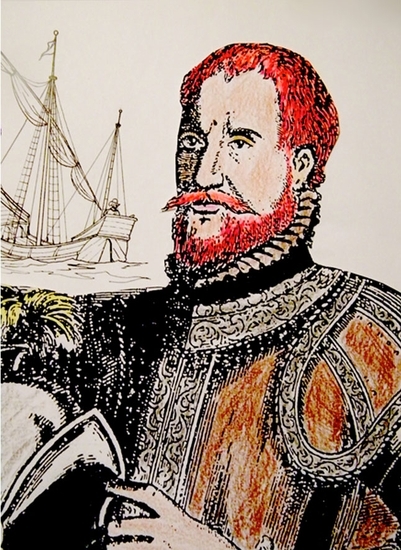 Juan Ponce de Leon returned to the New World in March of 1502. After his arrival in the Dominican Republic, Juan rose to the level of lieutenant in the local military. Here Ponce de Leon would serve directly under Juan de Esquivel. Before long, Esquivel was given the assignment of conquering the eastern most province of the Dominican Republic, which was called Higuey. In Higuey the Spaniards easily defeated the naked Tainos by using highly trained attack dogs. When Higuey again rebelled against the Spaniards is was Juan Ponce de Leon who was chosen to put down the new rebellion. However, even after being defeated the Tainos did not want to give up and become slaves. Again, they would rebel, only in this battle Ponce de Leon would become famous in Spain for his valor. After, Ponce de Leon's second successful campaign in Higuey, he was awarded a large encomienda in the Dominican Republic. In April of 1514, Ponce de Leon decided to return to Spain to see King Ferdinand. At this time he was also given a second contract to colonize Bimini and Florida. New, in this contract was the “Requirement” which gave Ponce de Leon the right to legally engage in slavery, as long as he read to the captives a legal document. Before long, the largest slave traders in the world were Hernando de Soto and Juan Ponce de Leon's nephew Hernan. Human beings were harvested now being harvested like produce in a field. On February 20, 1521, Ponce de Leon sailed from San Juan, Puerto Rico to Florida. This voyage was largely ignored because of Cortes and his conquest of Mexico and the Aztecs, which occurred at about the same time. Then one day there was a deadly confrontation near Tampa Bay with the Caloosa Indians. The Spaniards were overrun. Juan would eventually die from an arrow wound to the thigh. Hernan Ponce de Leon would also die in this battle. At the time Juan Ponce de Leon was 47 years of age.